McKee's 37 Total Headlight Restoration Kit Free Towel! ONE headlight restoration job and this kit will pay for itself! Are you a detailer that's looking to offer a complete headlight restoration package for your customers? Look no further than the McKee's 37 Professional Headlight Restoration System! This money-saving kit includes EVERYTHING you need to restore dull, faded headlights to like-new condition. Best of all, it contains McKee's 37 Headlight Coating, a 3 year protective shield that helps resist future oxidation and yellowing. All you need is a drill (we supplied the backing plate!) and you'll be in business. Headlights are supposed to shine bright so you have a clear view of the road at night. If you drive a vehicle that was manufactured in the last 30 years, it most likely has headlight lenses that are constructed out of polycarbonate plastic. Polycarbonate plastic, while extremely durable and resilient against abrasion and impact, has poor resistance to UV rays, causing it to yellow and fade overtime, reducing visibility at night. McKee's 37 All In One Headlight Restoring Polish gently polishes away the dull, faded layer of plastic to restore optical clarity so you can see clearly! Protect the newfound clear headlights with McKee's 37 Headlight Coating. This nano-glass ceramic coating will prevent the headlights from fading for up to 3 years! McKee's 37 All In One Headlight Restoring Polish, 8 oz. McKee's 37 All In One Headlight Restoring Polish is a one-step cleaner, compound and polish for plastic headlight lenses. Formulated using an advanced blend of micro and diminishing abrasives, McKee's 37 All In One Headlight Restoring Polish makes multi-step headlight polishing systems obsolete. In one simple step you’ll be able to restore yellowed, dull, faded plastic headlight lenses to like-new condition, increasing nighttime visibility and reducing glare. Not only are dull, cloudy headlights a safety hazard - they're a serious eyesore as well! McKee's 37 All In One Headlight Restoring Polish quickly and effortlessly removes years of oxidation and yellowing - in one step! Use it with a drill or dual action polisher. After just a few passes your headlights will look and perform like the day the vehicle was new. McKee's 37 Headlight Coating, 4 oz. McKee’s 37 Headlight Coating is a nano-glass ceramic coating designed specifically for polycarbonate headlight and taillight lenses. This high-solids formula adds an extra film of clear coat over new or restored headlight lenses, leaving them crystal clear and well-protected for up to 3 years. Designed to prevent UV-induced fading and discoloring, applying McKee’s 37 Headlight Coating to a brand-new vehicle will save you hundreds, if not thousands of dollars, over the course of ownership of the vehicle by preventing costly headlights from deteriorating. The 3 Inch Drill Backing Plate by Lake Country provides a quick and easy way to polish headlight lenses and other small body panels using a standard household drill. This handy backing plate is 3 inches in diameter, making it the perfect size for 3 inch, 3.5 inch and 4 inch pads. Durable hook and loop backing material ensures your pads don’t fly off during use; ¼ inch neoprene interface allows the backing plate to conform to curves and contours. Lake Country Thin Foamed Wool Pads combine the proven durability and immense cut of the thicker style Lake Country Foamed Wool Pads in a new, 1/4 inch thickness. This makes the Thin Foamed Wool Pads a better choice for headlight restoration. 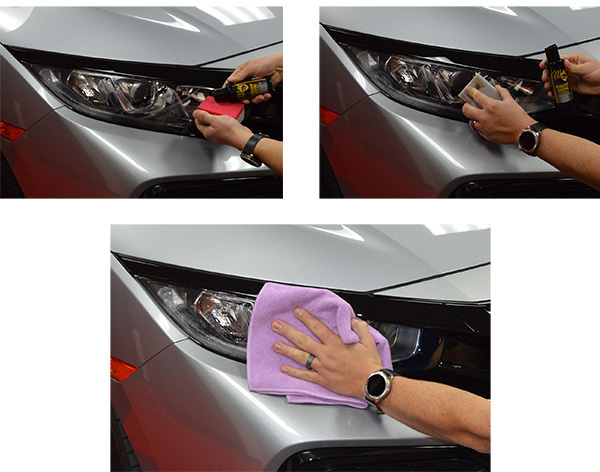 Use this premium quality microfiber towel to remove McKee's 37 All In One Headlight Restoring Polish. Plush nap will not scratch delicate surfaces. Directions: If applicable, remove oxidation and yellowing by using McKee’s 37 All-In-One Headlight Restoring Polish. Then, wipe the lens down with McKee’s 37 N-914 Rinseless Wash diluted 1:8 (paint prep ratio). Apply McKee’s 37 Headlight Coating directly onto a McKee’s 37 Coating Applicator. Evenly distribute the coating using a side to side and up and down hand motion. Immediately remove excess product using a clean, lint-free microfiber towel. Avoid exposing the headlight lens to water or moisture for 6 hours. Total retail value of $140.94. You save $40.95! Amazing 5 I have tried the store bought headlight restoring systems before and have had limited success. While there was some improvement with store bought it just was not satisfactory or long lasting. Enter McKee a 37. Made 8 year old beaten up lenses look like new! I am amazed and one happy camper. Would buy again but I have enough left over to start a repair business! Pros:Easy to work with. Easy to do.